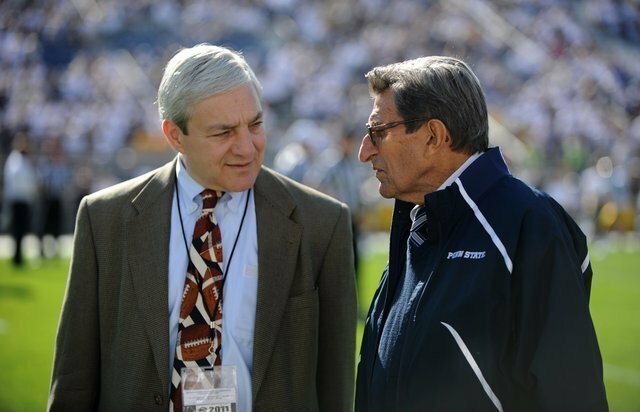 Spanier and Paterno, Better Days. Publication of the 267-page Freeh Report on Penn State University’s actions related to sexual abuse by Jerry Sandusky dominated the news today. Let me tell you, it is a fascinating, disturbing read. The Heartlessness Of the Matter: The report hammers home that University President Graham Spanier, Senior Vice President-Finance and Business Gary Schultz, Head Football Coach Joe Paterno and Athletic Director Tim Curley never demonstrated, “through actions or words, any concern for the safety and well-being of Sandusky’s victims until after Sandusky’s arrest.” Their concern was ensuring that — if assaults happened – they happened somewhere OTHER THAN on the Penn State Campus. They never spoke to Sandusky about the 1998 assault of an 11-year-old boy in the Lasch Building showers, which was reported to the University Police Department by the boy’s mother. Likewise, they failed to ask about the welfare of Victim 2 from 2001, whose assault was witnessed and reported by Assistant Coach Mike McQueary. When McQuery told Joe Paterno what he saw between Sandusky and the boy in the showers, Paterno waited several days to alert Curley and Schultz so as not to interfere with their weekends. What’s more, according to his attorney Sandusky offered to provide the name of Victim 2 to Curley for questioning, but Curley said he didn’t want it. What Jerry Knew: For more than a dozen years the “leadership” at Penn State looked the other way while Jerry Sandusky did as he pleased. Spanier, Schultz, Paterno and Curley were all aware of accusations against him – but Sandusky knew the PSU culture, and recognized that he had immunity. He was untouchable. In the face of the 1998 allegations, when interviewed by police and a Public Welfare case worker, Sandusky explained that he hugged the boy in the shower but that it wasn’t sexual. He was cautioned against showering with boys in the future, and agreed to stop doing so. It should have surprised no one that, over the next four years, Sandusky assaulted at least four more boys — often in those same showers. Shortly AFTER the 1998 incident, Sandusky announced his intention to retire but requested a position running a youth camp so that he could continue to work with young people “through Penn State”. That didn’t happen, but I suspect it was only because he was rehired for one year to assist Paterno. Gary Schultz Is a Liar: And not a very smart one considering the evidence Louis Freeh was able to uncover about his activities related to Sandusky. Although he testified before a grand jury in 2011 that he never knew details of the 1998 allegations, his personal emails and handwritten notes prove otherwise. In a memo at that time, he expressed concern that Sandusky’s behavior might at best be “inappropriate” and at worst be sexually improper. He questioned if there could be “other children”. After interviewing Sandusky, University Police Chief Harmon reassured Schultz via email that he could “justify” not pursuing charges due to lack of clear evidence of a crime. Justify? An interesting word choice.